Walmart jumped out Thursday with a natively built in-store mobile payment technology that works with any iOS or Android phone and any major credit or debit card. 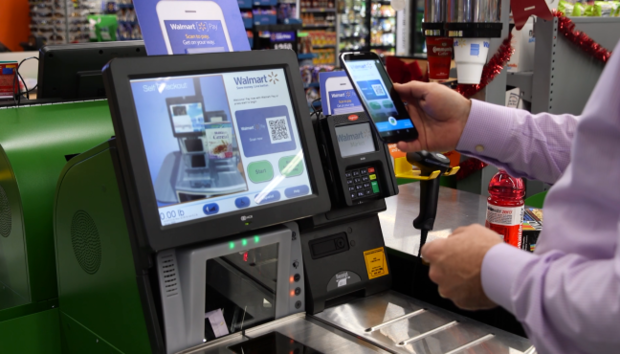 Walmart Pay works at a store's checkout by scanning a QR code on a Walmart smartphone app. The app is already used by 22 million Walmart customers each month for online shopping, including finding discounts and making online orders that can be picked up at the nearest store. "Without question, Walmart Pay is a strategic move" that can help the big box retailer outdistance competitors, said Jordan McKee, an analyst at 451 Research. "Walmart is tapping into a large, existing mobile app user base and attempting to grow the value of an already valuable audience." Use of the Walmart QR code is similar to the way Starbucks reads a user's QR code to deduct payments from a Starbucks card. Apple Pay and Google Pay rely on near-field communications (NFC), while Samsung Pay uses NFC and its Loop Pay magnetic payment technology. The biggest difference between Starbucks and Walmart Pay is the business purpose behind the similar technologies, said Gartner analyst Penny Gillespie in an interview. "With Starbucks, the functionality is payment and customer loyalty, but with Walmart, it is to provide an in-store shopping experience that crescendos with in-store payment." While Walmart has indeed bypassed many other retailers that are coping with transitions to mobile payments technology, Gillespie said the current Walmart Pay is "not mature." It doesn't go far enough with customer loyalty nor does it provide the fuller range of services that some mobile customers might expect, she said. With Starbucks payments, for instance, customers are linked to programs to get rewards for purchases and even a free coffee on their birthday. "In its current form, Walmart Pay leaves much to be desired," added McKee, of 451 Research. Walmart "sorely needs" to add customer loyalty, reward and coupon integration to Walmart Pay, he said, but these features could come next year with a bigger rollout. A company video shows the app can be used to order prescriptions, prepare a shopping list, store receipts and keep track of gift cards. The Walmart Pay add-on increases this functionality to cover the way payments are made in-store. The existing app had already allowed a user to order a product online and pick it up at a nearby store, either that day if available, or as soon as it could be stocked. Walmart seems to have launched Walmart Pay in a limited, pilot fashion to take advantage of holiday sales after seeing success with the existing app, Gillespie said. The retailer noted that online use of the existing mobile Walmart online shopping app doubled over the Thanksgiving holiday when compared to a year ago. Walmart spokeswoman Molly Blakeman said Walmart Pay is being rolled out in select stores in northwest Arkansas and will reach all 4,600 U.S. stores by mid-year. Blakeman, also said that Walmart still will remain in the MCX consortium of retailers and is piloting a CurrentC QR payment app in Columbus, Ohio. "CurrentC can be complementary to Walmart Pay," she said. She also said Walmart is in discussions to integrate other mobile payment services with Walmart Pay. "You might see Chase Pay," she said, as an example. Gillespie gave MCX, formed in 2012, only a 50-50 chance of ultimate success, partly because it has been so slow to roll out a mobile payment product. "Time-to-market has been excruciatingly slow, and MCX has to be careful or they'll lose relevance," she said. Analysts said Walmart may have moved ahead with Walmart Pay because it couldn't wait any longer for CurrentC to hit the market. "This is a critical time for mobile payments, and the window of opportunity for retailers to shape consumer behavior is limited," McKee said. "Walmart and others understand that dragging their feet means potentially missing the boat. Retailers are making a concerted push to develop mobile strategies that build out their relationship with the customer." As for Walmart's reliance on QR codes instead of NFC, McKee said Apple was partly to blame because it blocks direct developer access to the NFC technology on its iOS devices. Developers must rely on the Apple Pay app to leverage use of the NFC on an iPhone, while developers with Android phones can freely build NFC-based apps. "NFC alternatives such as QR codes will be mainstay in payments so long as Apple continues to block access to the NFC stack on iOS devices," McKee said.